What’s Next on the Data Analytics Horizon? Data Automation. Changes in IT services never stop. Just take a look at analytics. First, we had data analytics, big data analytics, smart data analytics and now (a drum roll, please) automated data analytics. It’s a new development but hardly surprising. As big data volumes and data sources grow, so do the time, effort and resources needed to process them. 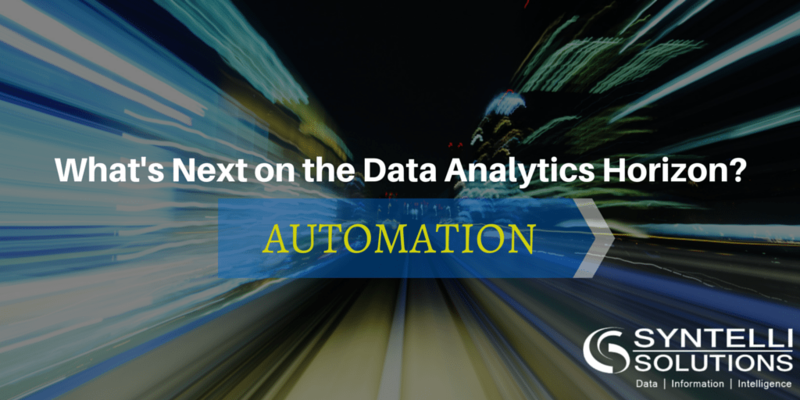 Automated data harvest, preparation and analysis are the only ways to keep up with the pace of data creation. Here’s a case study that shows how automated data analytics and rapid decision making provided new services to Canadian financial services customers. Toronto-based BMO Financial Group is a diversified financial services provider. The company’s more than 46,000 employees provide retail banking, wealth management and investment banking products and services to more than 12 million customers. As in enterprises everywhere, company officials wanted to use big data analytics to identify their customers more clearly and provide them with more relevant, personalized services. BMO technology leaders knew that achieving these goals would involve serious technical and business challenges. They were committed to using IT to make doing business with BMO easier, simpler and customized to individual customer requirements. But they also recognized that customers now expect BMO to know their preferences and respond to them in real time. And, customers expected financial services to be provided from several channels—bank branches, call centers, or online. TIBCO ActiveMatrix® BPM, which simplified and automated data capture, preparation and analytics. TIBCO Spotfire®, which enabled business users and analysts to query data and create visualizations quickly, without specialized training. Connecting the TIBCO centralized data store to all BMO customer channels, products and services across all lines of business gave analysts easy access to mountains of customer data. ActiveMatrix used real-time event processing to trigger actions based on events relevant to individual customers. And Spotfire enabled business users to search customer data to glean insights quickly enough to create and offer viable customer services. Dramatic reductions in time to market. Automated BPM workflows and resource assignment consistently reduced commercial lending and mortgage approvals times by 30 to 50 percent. More frequent offers of personalized services. The new TIBCO platform made it easier for BMO tellers to understand services and more comfortable in making offers to customers. As a result, tellers made personalized offers to specific customers 60 percent of the time, up from 5 percent. Faster development times. Offer development times fell from one day (8 hours) to minutes—nearly real time. Higher offer acceptance rates. Customers accepted offers three times more often than before installing the TIBCO platform. Lower data integration costs. BMO analysts used ActiveMatrix BPM to link the TIBCO and data integration platforms and facilitate straight-through processing. The result: integration cost reductions of 40 to 50 percent. Higher additional revenues. Revenues from relevant offers tripled initial project investment costs. Payback period was 9 months. Improved customer satisfaction. BMO cited upward-trending Customer satisfaction survey scores. Now that automated data analytics has an ongoing role at BMO, the company’s lineup of personalized services and increasingly happy customers are growing, too. In our previous post, read about the latest innovation from our Data Science team, on automation done entirely within Spotfire. Interested to see how your business can benefit from BI tools like Spotfire? Contact us or request a demo of Syntelli Services!